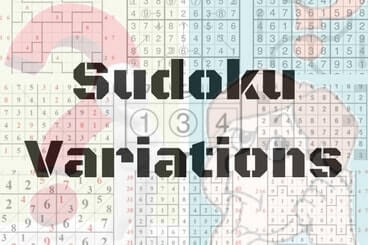 Many Sudoku Variations like XV Sudoku, Consecutive Sudoku, Average Sudoku, Kropki Sudoku etc follows converse Sudoku rules. Converse rules means that whenever a particular combination occurs then it is represented specially by some symbols in the Sudoku grid. Any absence of these symbols in the grid means that particular combination cannot come when these symbols are not given. I was trying to teach children concept of converse Sudoku rules. It was difficult to make them understand XV Sudoku Puzzle type. So to teach them this converse Sudoku rules I created this Odd Even Consecutive Sudoku puzzle type. This Sudoku type is very similar to Odd/Even Sudoku Puzzle type. It is very easy Sudoku type. However kids will love to solve Sudoku puzzles of this type. Classic Sudoku Rules apply. Additionally adjacent cells containing odd and even numbers are marked. Adjacent cells with no marking must either contain both odd number or both even numbers. 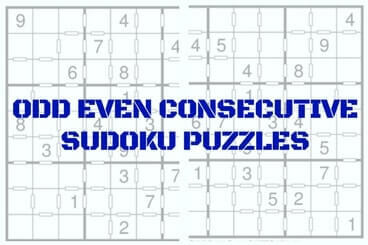 Here is the list of Odd Even Consecutive Sudoku puzzles which I created and published on Fun With Puzzles website.